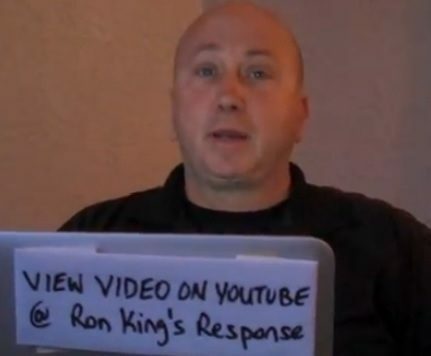 PORT CANAVERAL, Florida -- Former Port Canaveral Police Sergeant Ron King issued a statement in a You Tube video in response to his firing last week for allegedly using a target resembling Trayvon Martin for shooting practice. King, who is also a long-time firearms instructor, denied the allegations. He maintains that the target was a "no shoot" training aide. King added that the complaining party specified that the target was not used. He also said that a witness in the complaint stated that no derogatory statements were made. "As a result of last year's Trayvon Martin shooting, a company offered for sale a target of a faceless silhoutte wearing a hoodie with his hands in his pockets - one of which was holding two objects," said King. "These objects in the hand were non-threatening - and the target was something that I viewed as a "no-shoot" situation." King says that the motives behind the allegations are due to internal politics where one of his co-workers wants to ultimately see the Port Canaveral Chief of Police fired. "I would like to start my statement by first apologizing to the family of Trayvon Martin, for being used as a pawn in somebody's political agenda," said King. "I am being accused of using a Trayvon Martin silhouette target for firearms training in a manner that is less than professional. I take these allegations seriously, and I find that other are accusing me of something that I just plain did not do." Although Port Canaveral is over 60 miles away from the Trayvon Martin shooting in Sanford, Florida, it is within the Eighteenth Judicial Circuit which encompasses Brevard County and Seminole County - which means that the same State Attorney covers both counties.